Did OU play a great game on all sides of the ball? No. Just win and move on. After two straight losses in which OSU coach Mike Gundy was accused of being overly conservative, Gundy had quarterback Mason Rudolph and OSU's talented WR crew attack OU’ secondary all game. OSU was ranked by all kinds of pundits as the best passing attack in the country in the preseason, and at times on Saturday, it looked like it. A road win over a top 15 team is nothing to complain about, and OU is now poised to meet top 10 foe TCU for the lead in the right to be one of the two teams in the Big 12's conference championship game in Dallas. Of course, any College Football Playoff ambitions on OU’s part require that the Sooners win out. Plenty of pundits will predict that TCU’s defense will hold down OU’s impressive offense while Kenny Hill shreds OU's defense. With a big-play corps of receivers and depth at running back added to the best QB in college football, I still like OU's chances. Was that Marquise Brown or Antonio Brown playing for OU on Saturday? Brown had a breakout game in dominating the OSU secondary. He now owns the single-game receiving record for OU, ahead of recent WR standouts such as Dede Westbrook, Sterling Shepard, Ryan Broyles, Mark Clayton and Malcolm Kelly. His cross-country run of 84 yards past the entire OSU secondary looked like DeSean Jackson-type speed. Perhaps more impressive was his consistency in catching move-the-chains routes in between his long-distance catches. Mark Andrews had a huge day again. Meanwhile, Mykel Jones is flashing the same kind of consistency as Brown, forming a potentially lethal trio once you include CeeDee Lamb. Lamb had a quieter day, but he still made three big catches. Finally, Dmitri Flowers connected with Baker Mayfield on another big passing play. Why not great? Two critical interceptions, one of which seemed destined to cost OU the game in the fourth quarter. The bar that Mayfield has set is just that high. An amazing day passing the ball for Mayfield, who hit huge play after huge play. He helped make sure that OSU never grabbed any real lead, and the Cowboys were playing catch-up most of the game. Mayfield is very close to distancing himself in the conversation of the best OU QB, with company that includes two Heisman Trophy winners; one Heisman finalist and national championship-winning QB; and the holder of almost every passing record in OU history. 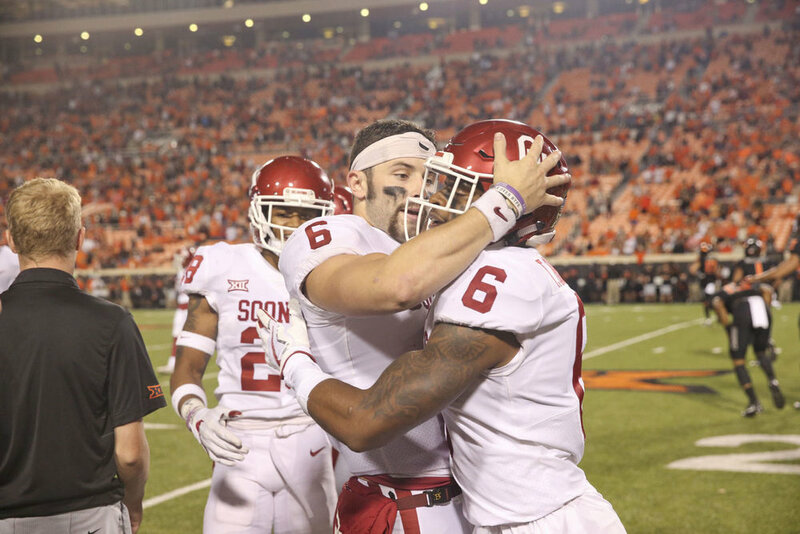 Mayfield’s the best player in college football, and he is very close to dragging a flawed OU team into the playoff. Rodney Anderson and Trey Sermon did all the damage this time. Fans and opponents alike never quite know what we are going to see from the OU running game this season. Right now, I think it’s safe to say Rodney Anderson is OU’s starting RB, while Abdul Adams and Sermon will flex into the No. 2 role based on performance and match-up. Both Anderson and Sermon are assets in the passing game as well. OSU did some creative things to sell out and stop OU’s running game. This was to be expected after OU trucked the Aggies the last two years with Joe Mixon and Samaje Perine. Coach Mullet was not going down like that again. Even though OU’s offensive line didn’t have the best game, Anderson had another big day. And while Sermon should have taken a Perine-like knee, I kind of like him housing his TD run. We will get to the the bad defensive effort, but OU had a rough start on offense with an early turnover and a quick three-and-out. OU’s defense held in the red zone for a field goal and forced a punt. The Sooners easily could have been down 14-0 and facing a very different game. If you told me that OU would hold OSU to 14 second half points, I’d have predicted an OU win. OU started getting more pressure on Rudolph and shutting down the running game after getting gashed on the ground for most of the first half. Will Johnson, D.J. Ward, Kenneth Mann, Caleb Kelly and Ogbonnia Okoronkwo all made big plays. After Mayfield threw what looked like a disastrous INT in the red zone late in the game, the defense stepped up big time. Siebert continues to have good games in all aspects of special teams: touchbacks, field-flipping punts and consistent field goals from medium range. His 36-yard FG in the second half helped OU salvage points from an OSU turnover. Just awful. Linebackers overrunning gaps led to big run plays. Horrible coverage by cornerbacks and safeties created huge passing plays. Mike Stoops continues to rush three at times and play passive ball instead of attacking. It’s baffling to watch Obo drop back in coverage on third down. At the start of the year, CB Parnell Motley was playing at an All-Big 12 level. The longer he has been in the starting lineup, the less effective he seems to be. In fact, he got pulled for a true freshman, Tre Norwood, who honestly played a better game. Jordan Thomas, another veteran of the regression effect, seems to be hurt, so OU was playing two freshmen in Norwood and Tre Brown. For TCU, OU might as well start both freshmen before the regression effect sets in.